Jaleh Esfahani was born in Esfahan, Iran. Jaleh finished Behesht Aeen high school in Esfahan and then worked for a few years. In 1945, she moved to Tehran where she was accepted at the Faculty of Literature, Tehran University. Shortly afterwards, she married Shams Badi, a young army officer. In 1946 she was the only female poet to attend the first Iranian congress of poets and writers in Tehran. After the persecution of Jaleh’s husband for his political views, the couple settled in Baku, Azerbaijan where Jaleh learnt Russian and Azeri and got a BA from Azerbaijan State University. She got her PhD in Persian literature from Lamanosov University, Moscow. From 1960, she worked at Maxim Gorky International Academy of Literature until she left Russia for Iran in 1980. In the turmoil of the revolution she left Iran for London when she currently lives. ‘Jaleh has been the most active female poet in the history of Persian literature’. She has published more than twenty volumes of poetry, most of which have been translated into Russian, Azeri and other Central Asian languages. Her work has also been translated into Czech, Kurdish and Arabic. 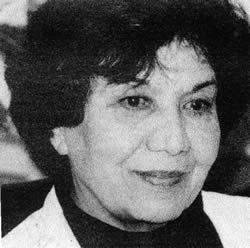 Apart from writing poetry, Jaleh has translated the works of Azeri poets into Persian. One of Jaleh’s dramatic pieces had been made into an opera and performed in Tajikistan. She has also conducted literary research. * Alborz mountains are a range of mountains separating the green north from dry central parts.